Cass Tech, on the strength of gold medalists in seven of the eight finals matches, won its 17th consecutive Detroit Public School League Division 1 girls’ tennis championship Tuesday at Barcus Tennis Center. Coach Clarence Wynn’s Lady Technicians totaled 22 points to finish ahead of Renaissance 17, Western 7, King 3, Osborn 2 and East English Village 0. Freshman Alayah Martin defeated Renaissance senior Cherise Strickland 4-6, 6-2, 6-2 at No. 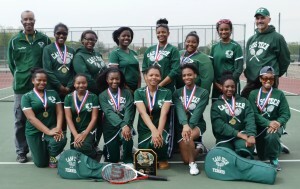 1 singles to lead Cass Tech’s parade of champions. Other singles champs were Cass Tech junior Emma Gates, who defeated Renaissance freshman Breanna Brown at No. 2, 6-0, 6-0; Cass Tech senior Jennifer Ude, who beat Renaissance sophomore Kymberli Maddox at No. 3, 6-2, 6-1; and Cass tech senior Jasmine Bell, who won at No. 4, 6-4, 6-4 against Renaissance sophomore Tierra Jones. Renaissance sophomore Randi Jackson and senior Christian Dowell won at No. 4 doubles 6-1, 6-1 against Western junior Seiry Morales and sophomore Vanessa Vela. The PSL Division II championship will be contested Wednesday at Barcus.